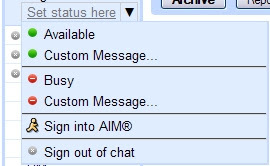 Gmail chat users now have the option to sign in to their AOL Instant Messenger (AIM) account to chat with their AIM buddies from Gmail. AIM buddies will populate you contacts list, and are searchable just like your Google Talk contacts. To start chatting with your AIM buddies just click on a name in your chat list, and start typing. Note that an AIM account is required to use this feature. AIM in Gmail is not a Google Talk and AIM federation; it's the ability to sign in to your AIM messaging account from Gmail. Gmail uses Open AIM to provide this feature.